Few bars in Liverpool offer a blend of fun, Hollywood glamour and great food and drink, which is why Arthouse Bar & Pizzeria is a breath of fresh air to the city centre. Step inside this remarkable new venue, which is located on Seel Street, to immerse yourself in the wonderful world of film, whilst enjoying delicious pizza and some pretty impressive cocktails. It’s hard to believe Arthouse was formerly the NHS Liverpool Clinical Commissioning Group building, as it seems as though the building was born to house this impressive bar. Designed to bring back the memories and style of the black and white movie era, you cannot help but be bowled over by the venue’s impeccable design, which offers plush black and white booths, projectors playing black and white movie clips and candelabras dramatically adorning each table. The bartenders also look the part, dressed in black tie that’s reminiscent of the iconic film era of the 1920s and 30s. 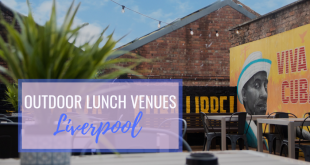 The walls are every inch as impressive as the classic design, featuring exposed white bricks and melted vinyl, offering a touch of old school chic to this stylish, laidback venue. Your mouth is bound to water when you hear about the delicious menu on offer at Arthouse Bar & Pizzeria. You can opt for fully loaded nachos, foot long hotdogs and, of course, your choice of pizza. There are also light bites for you to choose from, including spicy chicken wings and tangy barbecue pork ribs. If you’re looking for something to snack on as you drink, take your pick from the flavoured popcorns on offer for just £2. There are flavours to suit every pallet, such as chill & lime, barbecue, Cajun, salted, caramel, salt & vinegar, garlic and rosemary, plus so much more. You haven’t tasted cocktails quite like the ones their creating at Arthouse. Each delicious concoction has been inspired by a black and white movie legend. The larger than life Charlie Chapgin offers the perfect mix of elderflower, lemon, blueberry, apple and G’vine Gin. For a cocktail that packs a punch, we recommend the Yellapepperita, which is created from tequila, passion fruit & lime and yellow pepper. You haven’t experienced anything quite like it – and you’ll definitely return for more! One of our favourite cocktails on the menu has to be the Cherry Grant. Not only does it have an amazing cocktail name, inspired by Hollywood legend Cary Grant, but it is a wonderful mix of amaretto, coconut rum, overproof rum and cherry. Amazing! On top of offering customers an extensive list of wines and draft beers, Arthouse Bar & Pizzeria has also introduced their very own craft beer, Arthouse Vier, which is served on draft. Beer lovers won’t be able to get enough of the newest addition to the Liverpool craft beer scene. Arthouse Bar & Pizzeria is the first stage of Arthouse Hotel – Signature Living’s newest hotel that will open later this year, providing guests will all the fun, style and glamour of the movies. Arthouse Bar & Pizzeria officially launched on Thursday 28th July 2016, offering all the glamour of the black and white movie era. Love Island’s very own Katie Salmon hit the bar’s red carpet, and enjoyed their amazing cocktails created by Arthouse’s talented mixologists. Hundreds of Liverpudlians were in attendance, keen to sample the scrumptious food and drink, and could take their pick from nine flavours from the popcorn stand, head to the candy floss station or could grab some cinema-style ice cream from an attendant. All of the guests had a fantastic time in the movie-style photo-booth, and donned facemasks of movie icons such as Audrey Hepburn, Marilyn Monroe and James Dean. So, if you haven’t dropped in on Arthouse Bar & Pizzeria yet, now is the time to do so. You’ll find it in the heart of the city’s ropewalks district on Seel Street, just over the road from Heebie Jeebies.